The government said Monday it will collect up to 24.2 percent of corporate and local income taxes from South Korea's cryptocurrency exchanges this year. The Seoul government has been striving to rein in the virtual currency frenzy in Asia's fourth-largest economy while contemplating a bill to ban cryptocurrency exchanges. Amid concerns over a bubble, the government last month banned the opening of new virtual accounts for cryptocurrency investors and required virtual currency traders to change their virtual accounts to real-name ones. Bitcoin, ethereum and other cryptocurrencies have rapidly gained popularity among South Korean investors recently as a means of making quick money. South Korea is home to one of the world's biggest private bitcoin exchanges, with more than 2 million people estimated to own some of the best-known digital currency. Under current laws, all corporations with income of over 20 billion won (US$18.7 million) are required to pay 22 percent and 2.2 percent of corporate and local income taxes on their income. Virtual currency exchanges should pay the corporate tax on income earned last year by the end of March and the local income tax by the end of April, an official from the Ministry of Strategy and Finance said. 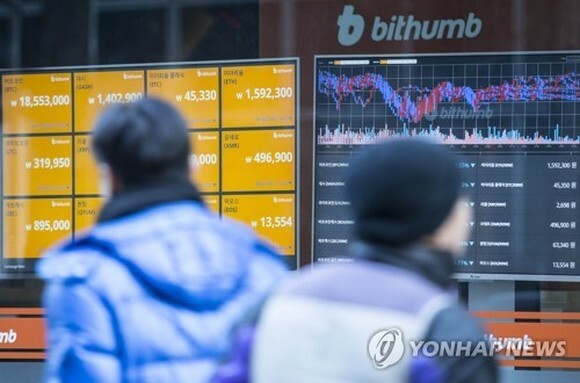 Bithumb, one of South Korea's major cryptocurrency exchanges, is expected to pay about 60 billion won in corporate and local income taxes as its estimated earnings reached 317.6 billion won last year, according to Yujin Investment & Securities. Bithumb reported 49.23 billion won in earnings on 49.27 billion won of sales for the first seven months last year. Upbit, another South Korean cryptocurrency exchange, ranked first in daily turnover with $4 billion as of 5:30 p.m. Sunday, according to cryptocurrency price tracker CoinMarketCap. Bithumb came in second with $3.93 billion, Coinone 11th at $455 million and Korbit 17th at 175 million. Source from the Yonhap.